In today’s dynamic world of fickleness, the only constant is what is within, be it for a person, objects, designs or websites. What’s on the inside is more important, especially when it comes to websites. It is very easy to get smitten with the design and content, when launching a website and forgo security concerns. You need to be really concerned about security of your website especially if you have an e-commerce website. E-commerce sites are sore spots for hackers interested in stealing personal and monetary information and other consumer data. Not only you lose the data, you lose the trust in your brand. Once the security breach makes the news, even your loyal customers think twice before buying from your business. The need to have a secure website with a secured payment gateway can never be stressed enough. Get flexible, scalable and bespoke payment integration services to grow with your business with Carmatec. We integrate order forms, e-commerce carts or customer portals with a whole range of payment gateways like PayPal, Authorize.net, First Data and many more. We can integrate your website with a diverse range of payment gateway options in shortest possible time. Get the control of your business in your hands with Carmatec’s customized Payment Integration solutions. In brick and mortar stores, your customers give you cash or card and you can charge them on spot. 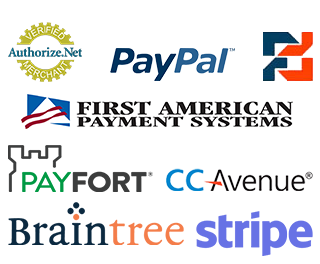 However, for online stores, you need payment gateway to process monetary transactions for you. When you want to sell something, your customers enter their card details during the check-out phase. Then your website sends that credit or debit card information to payment gateway for authorizing the transaction and processing the payment. In short, a payment gateway is an application allowing a store to securely accepting payments from customers. After your customers has clicked on the ‘order’ payment gateway handles all other steps from verifying the information, checking the payment method and approving the payment request. The major job of a payment gateway is to securely authorize settlement data and payments to and from merchant’s website merchant’s processor. In a nutshell, it handles authorization, settling, and reporting. It captures the transaction, encrypts the information, routing it to payment processor and returning notice of either approval or declination. The consumer is not involved in the process as the payment gateway integration happens in the backend. Think about the advantages if you can purchase a product right away. Payment gateway integrations are a must-have feature now. An order form or customer portal integrated with payment gateways not only save time but are much easier and faster way to do business. When it comes to sales, if it ensues NOW, it happens, and if NOT, you lose the customer to your competitor. Carmatec proposes to ensure the system security for all the applications & websites installed and configured to keep the system live 24x7. The proposed application includes payment gateway integration which requires PCI-DSS compliance to be maintained on the server hosting the web application. PCI-DSS compliance ensures that the application server is protected against all the security loopholes which can compromise the confidential business & customer data.